"No one will know you're drinking a cosmo." A manly man wouldn't be caught dead with a pink drink in his hand - but your pal sure does love his cranberry cocktails. Now he can enjoy his pink drink in public without fear of ridicule. 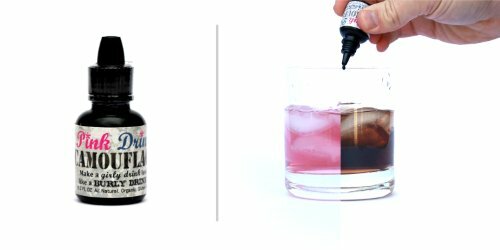 Our flavorless magic drink drops will disguise that fruity cocktail to look like a whiskey on the rocks. Drink up! Is it safe? Of course! Pink Drink Camouflage is a magical liquid drink coloring made from all natural ingredients that are vegan friendly, kosher certified, and gluten free - packed full of powerful anti-oxidants and has anti-inflammatory properties. This natural food coloring is also heat and freeze stable. Does it affect the taste of my drink? Although made from natural ingredients, a few drops of Pink Drink Camouflage does not affect the taste of liquids. It is highly concentrated and has a consistency that is slightly thicker than water. NOTE: Smartsy LLC (dba Pink Drink Camouflage) makes no claims about the suitability of natural drink colors for any given purpose. If used in large quantities - will impart some flavor on the finished product, and may render unsatisfactory results. How can I purchase? Online orders are processed and fulfilled by Amazon, which accepts all major credit and debit cards.